WHALE SONG in a dramatic setting on the ocean with awesome views of the ocean surf, sunsets & the Pt. 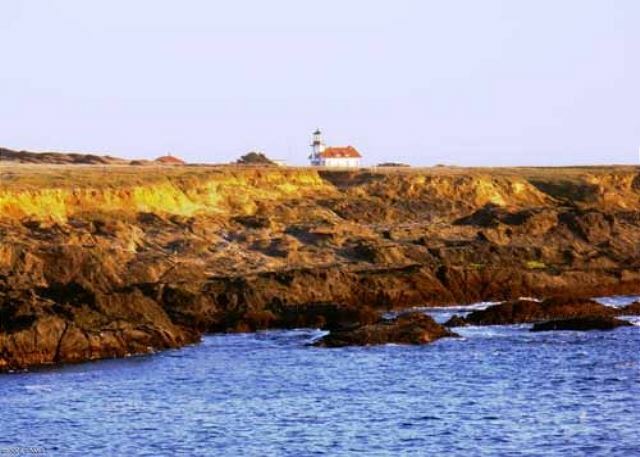 Cabrillo light house - with three bedrooms, two baths, and just three miles from Mendocino. Can it get much better than this? 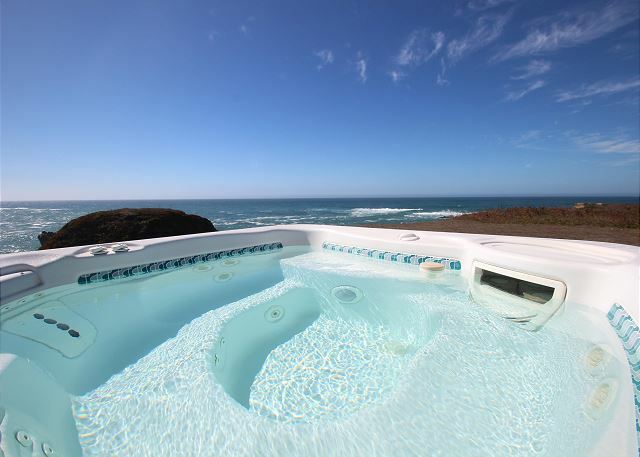 There’s a large, expansive deck overlooking the surging ocean with the bluff edge just 25 feet away, a small cove and the lighthouse across the Bay, and - for those indulgent moments - a hot tub. Three bedrooms, an open-space living area with lots of view windows. Just sit back, relax, and marvel in the views. The Point Cabrillo lighthouse can be mesmerizing... the cove - with its history of "The Frolic shipwreck - is just steps away. Whale Song is within walking distance to the State preserve surrounding the Lighthouse and it’s only a half-mile walk to the Caspar Beach. A great getaway... but you'll have to share Whale Song with feathered friends – songbirds, gulls and geese. Because of the cliff front location there is a minimum age of 10 years and over required for any guests. 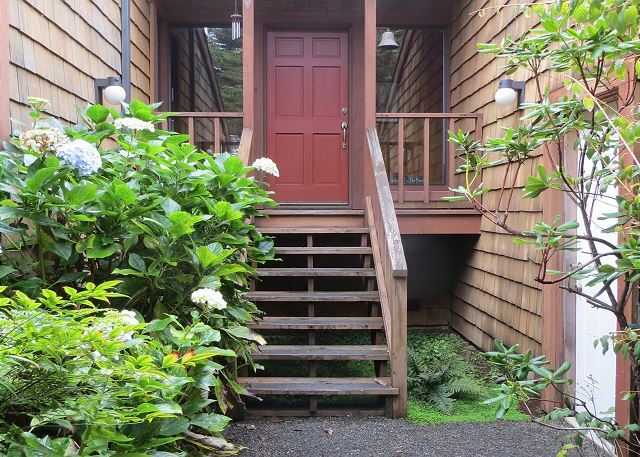 Mendocino is one of our favorite places to visit and this rental home now ranks as one of our top places to stay. Beutiful views all around and very comfortable. What a great get away! Loved spending time on deck watching the Whales swim by even seen a few whale tales! Will definitely be back. 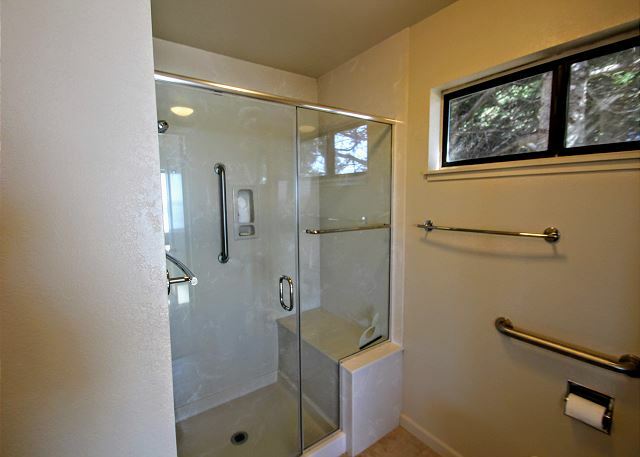 We have stayed at many homes in Fort Bragg and Mendinco this one is for sure a favorite. Fantastic location but needs help. We love the house and the incredible location. Some small details are left reading lamp im master bedroom and very poor lighting in living room, especially over dining room table. It is in a great location and we enjoyed just sitting there looking at the ocean. However, if you enjoy cooking, there is no garbage disposal and the hot water barely comes out of the kitchen sink. The whole place needs a little upgrading, but it is supposed to be rustic. I'll be back. Thank you very much for the feedback Richard. We wanted to let you know the problem with the hot water has been addressed. Please know in the future that we are happy to try to get any problems you experience fixed during your stay. Thanks again! We loved the house and location. Only comment is that the lighting is poor for reading. NEED a reading light for the bathroom side of the bed in the master bedroom. Beautiful home. Needs to have a new mattress in the master bathroom and few minor repairs. Overall, a wonderful home with an excellent view. My wife and I are seasoned users of vacation home rentals. We thoroughly enjoyed our three day stay at Whale Song. The home is situated on a ridge immediately overlooking the ocean. The sound of the waves was very soothing as was the incredible views. 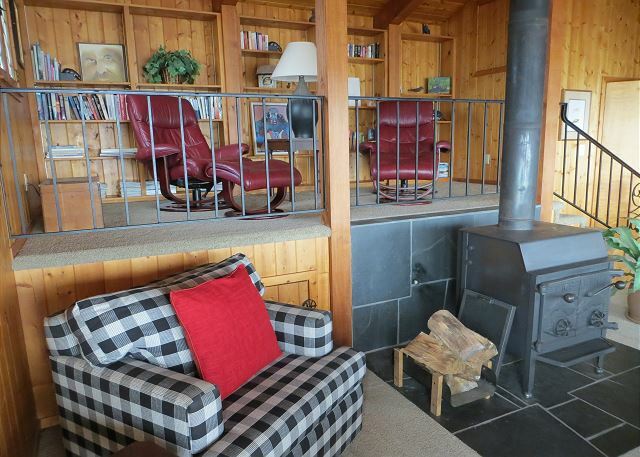 The home is well appointed, with a wonderful loft with super comfy chairs overlooking the ocean, ideal for reading. Also, a great deck for whale viewing in season. We didn't use the hot tub, but would be great for full family use. The TV and WiFi worked seamlessly. 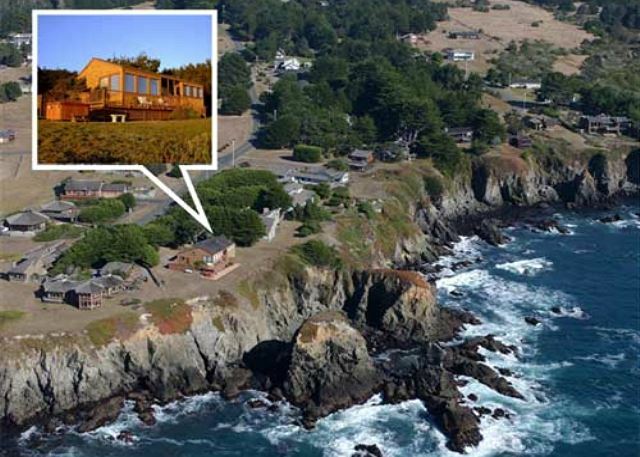 The home is a short few miles from down town Mendocino and a short 11 mile drive to Ft. Bragg. We highly recommend this rental. Only negatives are minor: squeaky king bed in master bedroom, lack of reading light on one side of master bedroom bed and the lightly pervasive but discernible musty odor from the wall to wall carpeting throughout the house. Might be a problem for anyone with allergies. We loved our stay at Whale Song. The view was amazing, the location was close to Mendocino and Ft. Bragg. The home was very clean and well taken care off. It was a special time in a special place for us! Definitely would recommend this home. Very enjoyable. Only a couple of suggestions: 1) coffee pot doesn’t work. Found a French press which was totally fine. 2). Given this is a coastal rental, I’d like to suggest supplying a pot large enough for a crab boil. Nothing fancy. But we could only boil one crab at a time. 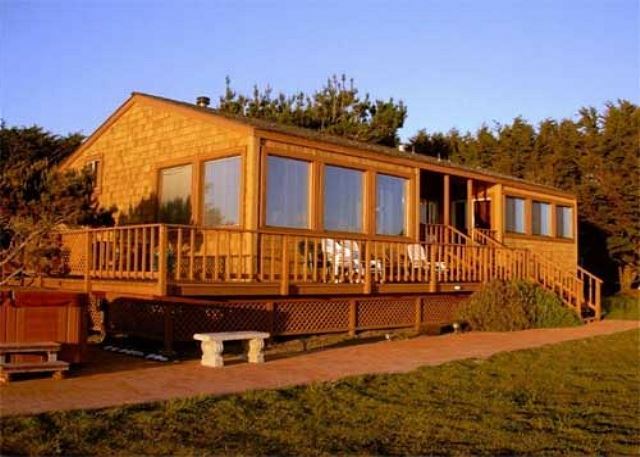 This is the best place to stay in the Mendocino area, and we have stayed many many places. The view is extraordinary - it is like the ocean is in your living room. The house is perfect - comfortable, well appointed. This was our second stay at Whale Song, and we enjoyed it as much as the first time!. It is a great location, and we spent many hours just watching the waves and the lighthouse. It is well appointed, with everything needed for cooking meals. This house would be comfortable for 6 people. The Northern California coast is amazing, so you cannot go wrong when you stay on the bluffs. The Whale Song view is really nice. The house has a nice lay out. For the afternoon sunny days, there are shades to pull over the windows which let you see outside but greatly diminish the glare, which is really nice. The area is quiet, and the house was clean. When you are trying to decide where to stay, I think the negative things are what you want to know so you are aware before you choose. I wish the beds were better, they are hard, when you are used to some plush. I also wish that there were black out curtains in the Master bedroom to block the continual every few seconds flashing of the Lighthouse when you are trying to sleep. During the day, we loved seeing the lighthouse, but when you are trying to sleep, it really was annoying. The Master shower was not hot enough, and the mechanism didn't allow me to increase the temperature. These things, I mentioned to the managers of the property, so they may have corrected them. Hello Susan, thank you for the review. We are very happy you enjoyed the home. We did receive your feedback and will turn up the hot water and get some blackout curtains up ASAP. Thank you very much for the feedback and for being a valued guest! We keep coming back to this rental property, but keep hoping that the next time we come back the kitchen will be upgraded. The dishwasher has got some problems, and kitchen cabinetry is a bit wonky & worn; however, the home is otherwise splendid and the location one of the best we've experienced in years of traveling to the Mendocino area. Hello Robert, thanks you so much for the review. We actually currently are working with the homeowners to renovate the kitchen extensively. As you probably know, projects like these can take some time, but there is a good chance that your next visit to Whale Song will feature a new kitchen. Thank you so much for being our guest and for the feedback. Everything wonderful. Place spotlessly clean. Only thing is that the garage was locked and we couldnt use it, but this a minor thing, not keeping us from coming again. Perfect! 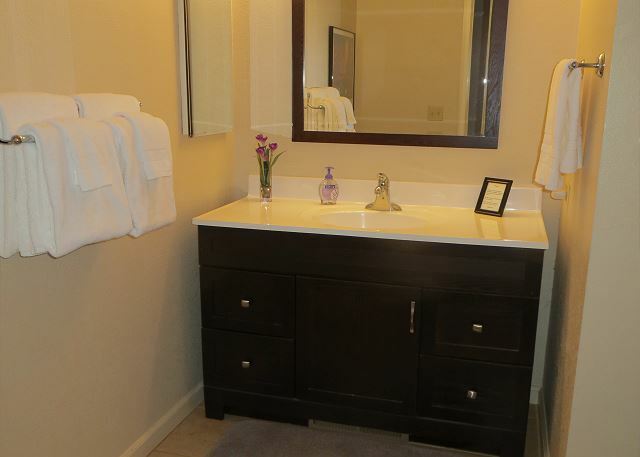 Very clean upon arrival, all the amenities you need. Hot tub and landscape clean along with great location for Hot Tub. Whale Song had a terrific location, right across the cove from the lighthouse. It was nicely appointed and spotless. We had daily visits on the back lawn from a Great Blue Heron, and we could see many whale spouts on the horizon. We've rented a number of Mendo Preferred properties, and have always appreciated the high level of customer service and quality we receive. Our only issue with the property was at night, the lighthouse light was so direct that even with the blinds shut and our eyes closed in the Master Bedroom, it was like a strobe light going off every 20 seconds. Blackout drapes or sleeping masks would resolve the issue. We stayed at Whale Song for 5 days in January. The house is within walking distance of the Point Cabrillo lighthouse and a short drive to Mendocino. We thoroughly enjoyed our stay. The house is in a quiet neighborhood is exactly as represented in the photos. There is a wonderful view from every window and a charming garden entryway. We saw many whales from the house. Despite our best intentions (we had too much fun sightseeing on the way) we arrived after dark but it was easy to pick up the keys and the directions to the house were excellent. Mendocino is a lovely town. There is a well stocked market, a wonderful bakery, and many good restaurants. I would go back in a heartbeat. it is as usual a heavenly retreat. Over the last few years I must have rented this beautiful cliff house at least 10 times. We never had a disappointing experience. I along with several friends have enjoyed Whale Song many times over the years. This is a "home"..not just a rental. Always clean, kitchen supplied,(minus your own food) and located perfectly on oceans edge. Central to both Mendocino & Fort Bragg and all that the coast has to offer. If you visit you will return. Great place to rent. The home was well equipped and very comfortable. Beautiful! We needed a relaxing vacation get away & that is exactly what we got! We really enjoyed our stay. The view is hands down awesome!! Everything was great. The house was clean upon arrival. The yard was perfect for our dog & 10yr old child. It's close to Mendocino & Ft. Bragg. I have stayed in other rentals & this one was much cleaner & was updated & had things I didn't even need to bring. I didn't have to do the laundry. But, when I stay somewhere, I treat the location as I would my own. I know I pay for it and it's not cheap but I still think you should take care of it as you would your own. Call me old fashioned. All of us enjoyed the amazing views, the hot tub, the relaxing atmosphere & just everything. My mom already wants to come back & that is saying something! we had s wonderful and relaxing experience. the house was very clean. This is our 2nd time at Whale Song. We enjoy the house even though it's just 2 of us. The kitchen is well appointed. The only problem is a leak in the shower door in the Master shower which soaks the floor; this happened on our last stay also. We used all the towels in both bathrooms in order to keep the floor somewhat dry. I like working with Cindy, she's friendly and professional. The house was exactly "as described", perfect ! delicious dinners. There was only one negative and that was that the dishwasher did not work. Really beautiful spot, awesome hot tub overlooking the ocean. Very comfortable. We had a mix-up over the departure time on Sunday (probably our fault) and the managers were really nice and understanding. Pleasant; house was clean and well stocked. Family gathering on the coast for a few days. Time to catch up, share memories, make new ones, eat great food and sip wine. This is becoming a family tradition for us to rent a house on the Mendocino Coast and spend Mother's Day with my two sons and their partners. It's a lovely way to celebrate this special day. Experience was just perfect. The home was beautiful, well appointed, clean and comfortable. The staff at Mendocino Preferred was accommodating in the extreme, friendly and flexible. Will return. We have stayed at perhaps ten different rental houses over the past 20 years. This is by far the best. The views are unbelieveable. You can't really even call them "views". From all the windows in the living room/dining room area, and the master bedroom, the ocean fills each window completely, with white water and the lighthouse as well we the calmer ocean beyond. Everything in the house works. It is not luxurious - but it is more than "cozy". Unbelieveable place in every way. We have stayed many places in Mendocino over 25 years and this is by far the best. The ocean views fill up the entire windows. Wonderful ambiance and a world class ocean view right on the Caspar bluffs. The Point Cabrillo lighthouse was visible from the back deck. Whale Song had exactly what we were looking for, and so much more! It was the ideal coast getaway for my husband, small dog and me. The house is clean and cozy and perfectly appointed. The bank of windows really brings the dramatic landscape right into your living room! We enjoyed the hot tub under the stars, looking for whales, exploring the area and hiking out to Point Cabrillo Light Station. We hope to return in the near future! Loved this property. Perfect location. Just steps away from ocean. Convenient to everything. Only suggestion is to put draperies in the master bedroom to block out the light from the lighthouse. Made it a little difficult to sleep, but draps should easily solve this. Enjoy the energy of the Pacific, the quest for a whale sighting, bark of the sea lions, magic of a working lighthouse all from the comfort of your beautiful home. Views everywhere! Everything you need here! All the jones family men are divers. This is a vacation to get some abalone to eat and to wash it down with some great wine we found while traveling the Alexander valley to get there. We were stunned by the panoramic ocean view as soon as we walked in the door. We never got over it! The house was warm and inviting and totally met our needs. Kitchen was well stocked with everything a person would need. Beds are super comfortable. We loved everything about Whale Song. Wonderful location!!! And ... Cindy and the Staff were excellent in every way. Completely awesome. This is the best house in Mendocino. The views are unbelieveable. Like living in an Imax theater. The house is not fancy - it is totally comfortable, intelligently laid out, workable. This was our 2nd stay at Whale Song. The house is nice and well appointed. Bed in master is very comfortable. They provide binoculars which you will use to spot whales and a pair of Peregrine falcons (on the rock in front of the house). We arrive in early evening and the house was nice and warm and the lights were on which was very nice. We also had a welcoming bottle of wine! We walked the path to glass beach (nice for walking or biking) and also did our usual walk out to Pt. Cabrillo lighthouse (directly across from the house). Had a wonderful dinner at The Restaurant in Ft. Bragg. Had the best filet ever. I would recommend this to anyone who wants a relaxing, enjoyable trip. The weather was spectacular, the best of the 6 times we have stayed on the coast. We have stayed in this house 3 times over 10+ years, and the location is perfect. Furnishings are better than the last time, but the kitchen is still dated and the thermostat flakey. Couldn't adjust the temp without it resetting and I followed the directions.Master BR needs better darkening vs. lighthouse. We were speechless when we arrived and looked out at the incredible view of the ocean with nothing to obstruct our view from the deck or the windows. The house was very clean, furniture very comfortable, and the kitchen was well-stocked. The neighborhood is lovely and quiet. The Pt. Cabrillo lighthouse is clearly visible from the house, and if you are sensitive to light, bring some nightshades to wear because the beacon of light does hit the master bedroom windows every 10 seconds. We had incredible lunches at Café Beaujolais in Mendocino, which is a short drive from the house. We hiked, biked, rented canoes, and shopped. Everything is within a 10-minute drive. By far, this was the most relaxed we have been in years! We spent hours staring out at the ocean as the waves crashed over the rocks. We enjoyed the little library loft with two comfy leather recliners that faced the wall of windows looking out on the water. We can't wait to return someday! I live in California, we had family traveling in and chose Whale song! When we walked in the door we were amazed. The view is absolute perfection, you feel completely at peace. The house is well laid out, and really almost soundproof from living area to bedrooms. We all thought the kitchen was extremley well equipped and we really wanted for nothing! 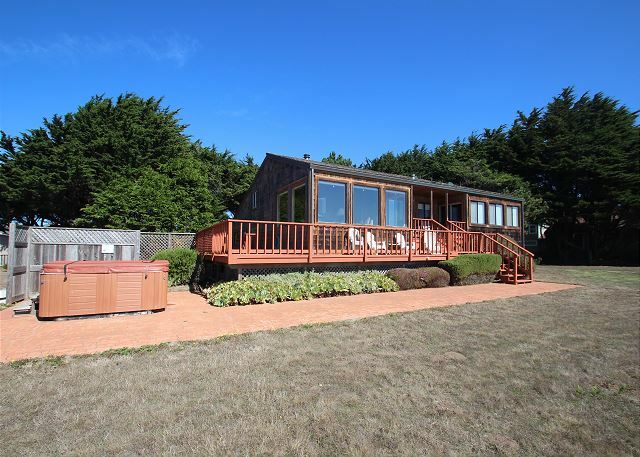 Perfect house, great location from Mendocino town, we are counting the day to return! I highly recommend. The feel of the place was great and the view is exceptional. It is close enough to Mendocino yet out of the way and very private. Only two minor bugs: we had to reset the WiFi several times and one toilet was leaking. Otherwise, everything was perfect. Aside from having to kill a few spiders in the beds and bedrooms we had a wonderful time. This home and it's location is absolutely our favorite place to go when staying at the coast. We will always prefer Whalesong as our #1 Choice of Stay! Our Stay at Whale Song. Whale Song home was fabulous! The home was located in a quiet cul-de-sac. Very comfortable and clean home with all amenities. Very well maintained. Kitchen & bathrooms very nice. The home has incredible views! Great layout with the 3 bedrooms far apart for privacy. We loved the sitting deck in between the living area & master bedroom. 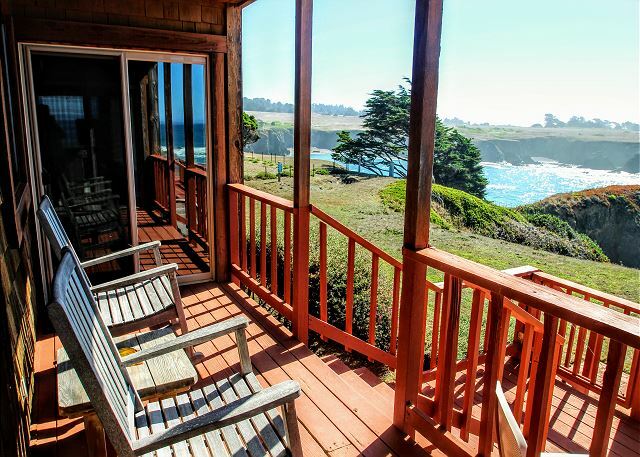 I have stayed in many rental homes from the Sonoma County coastline to Mendocino Coastline and this home is the best by far and my new favorite home to rent. A paradise you don't want to leave! The home was easy to locate and ready to use upon arrival. The views of the ocean from this location is second to none! The home was ready and equipped to make our stay very relaxing. You know it is special when your family begs you to be able to keep staying! This was my 4th visit to Whale Song. Each time more beautiful than the last. (It seems that way although each was wonderful) Wild life on land,sea, & air are most abundant. Deer to watch along with a wild turkey here and there. Visited the lighthouse and of course Mendocino with all our favorite spots. Property Mgt. is always helpful if a question arises. Two of my friends have been to Whale Song and enjoyed with the same results. And yes, we did see Whales heading North from the living room view! Couldn't have gotten any better! Definitely be returning here in the future! It was beyond a great experience! We have been renting this house for years and it never disappoints. The house is basic and comfortable. The view is the best of all the places we've stayed in the area. The whale were migrating so it truly was whale song! This property provides the perfect environment for a relaxing & wonderous get away. A great ocean view & cozy interior, as well as lovely grounds, make Whale Song an ideal coastal vacation home. A near-by beach and an easy commute to either Fort Bragg or Mendocino provide convenient opportunities for off-site exploration & adventure. The staff at Mendocino Preferred are accommodating, helpful & very gracious. My wife and I stayed here with my brother and sister in law for our anniversaries. We had a fantastic time,the views were priceless and breath taking. Could not ask for a better place to celebrate our anniversaries. The four of us were absolutely thrilled with our stay--my brother-in-law didn't even unpack before he took a chair out to the bluff to relax with the fabulous ocean view. The home was very clean and extremely comfortable for the four of us. The only additional plus would be that I would have liked another king size bed since there were two couples. We have rented this same house many times. It is the only one that we ever rent in Mendo. We have been coming to Mendo at least twice a year for the last 35 years, and have settled in with Whale Song as our one and only favorite. I hope it will always be available in years to come. AMAZING . This house is set on a bluff over looking the ocean. Its Spectacular. There is a view from every room in the house. So beautiful. We were able to bring out K9 also (pet friendly). The house had everything you would need. We loved it so much. And there is hiking galore. Walk to the beach, or to the Cabrillo Light House. Cant wait to return. 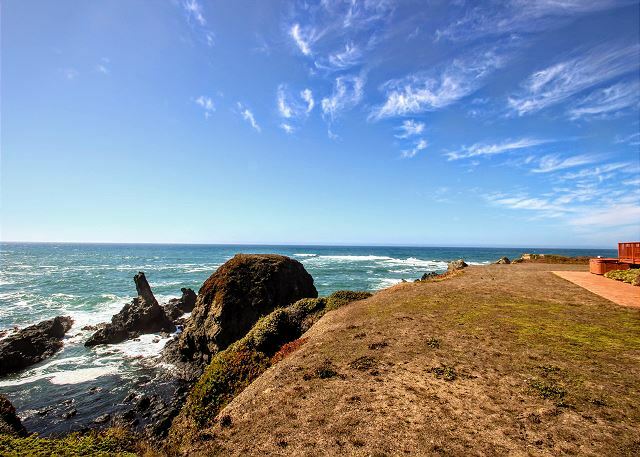 This property can't be beat for location-between Ft. Bragg and Mendocino, five minutes to lighthouse (or you can hike there), and 10 minutes to Russian Gulch State Park. Best of all is the view from the house- dramatic coastal location with great views from all the living spaces and master bedroom. The furniture is comfortable and well placed. The "loft" in the living room is also a plus. My only complaint is that the kitchen is very small (but has a great view!) so if you like to cook it can be challenging to have more than one person in the kitchen at a time and don't even think about opening the dishwasher! Also many of the pots and pan need to be replaced. The coating on many is coming off- nice stainless would be appreciated (Costco has a good set). Otherwise we love this place and will stay here again…and again. This was my second visit to Whale Song. Words are not sufficient to describe the beauty….one of the most beautiful places in the world. The house is designed and furnished top notch. I enjoy the central location between Mendocino and Ft. Bragg. A equal time of enjoying the area can be spent just sitting outside on the deck gazing at the ocean, wildlife, and reading. A very special place. I will return again! 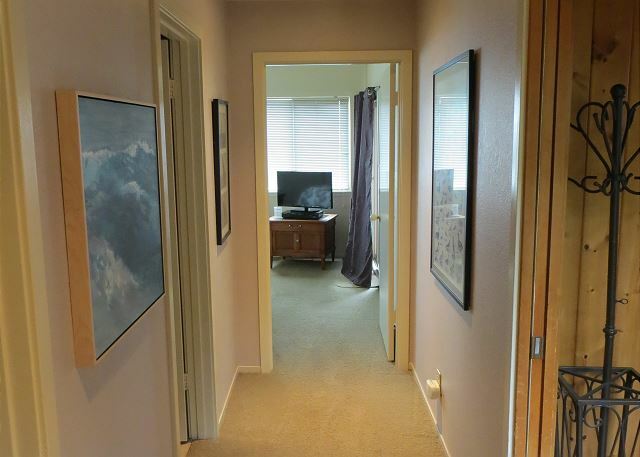 Generally, I expect a rental property to be somewhat less than its depiction in its photos, but Whale Song far exceeded our expectations. The entire house was spotless, with new linens (and lots of them) and a well-stocked kitchen. The views from the house, porch and hot tub are world-class; we cancelled one evening's dinner reservations just so we could stay in and enjoy more time there. I recommend it wholeheartedly. Third time in this house. Great location. Wonderful time. Always a joy for relaxing vacation.